The next Fall, when I could buy bags of field fresh onions at Greenmarket for little money, I remembered that, and decided the onion would be a good choice for pre-cooking. I pulled out a heavy frying pan, sliced pounds of onion almost paper thin, and cooked it up and froze it. 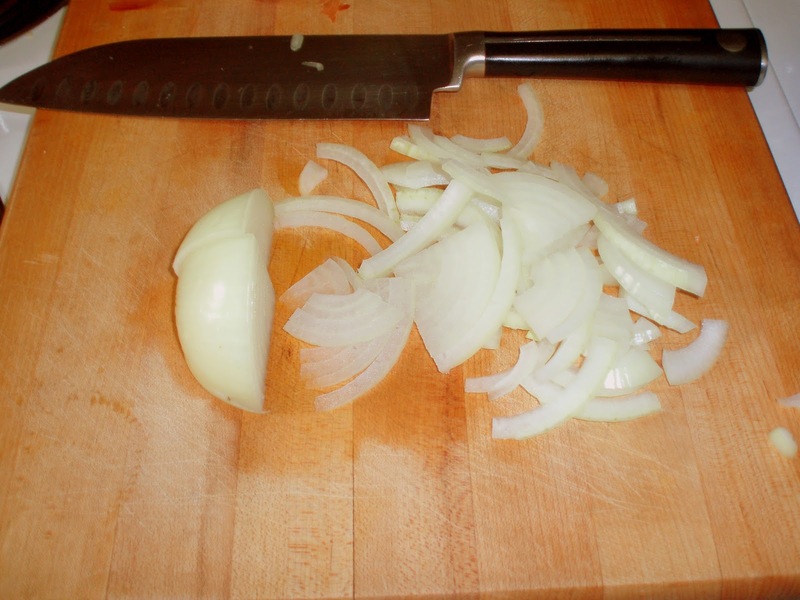 (I then found myself going to it when I didn’t feel well for cooked onion – which is the reason I then started pre-cooking ordinary sauteed onion.) But it was very easy to use it to make a quick curry. A few weeks ago, I bought my ten pound bag of beautifully fresh onions, and cooked about half of them. I cut them in half, and then cut the half again, and sliced them thinly, so they fell in fine shreds. Then I took out a big heavy enameled cast iron pan – the heaviest pan I have – heated canola oil in it, and filled it with the shredded onion. The onion cooks down incredibly, as the fresh juice simmers and concentrates, so I basically kept slicing, adding, and stirring. Once the pan was full, I put the heat as low as I could, and left it there, stirring occasionally. (I did this on a Sunday afternoon while watching a Mets game, and stirred between innings… it does take time, but most of it isn’t my time.) The onion just kept melting into a smooth mass of savory goodness – the kitchen smelled wonderful! 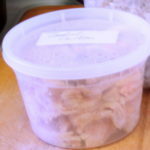 Once I had it the way I wanted, it, I turned off the heat and let it cool, then packed it in zipper bags, pressed thin, so I can easily break off pieces the size I want. It’s amazing how little space five pounds of onion takes, after it is cooked down. I lay the bags flat in the freezer, and knew I had gold. 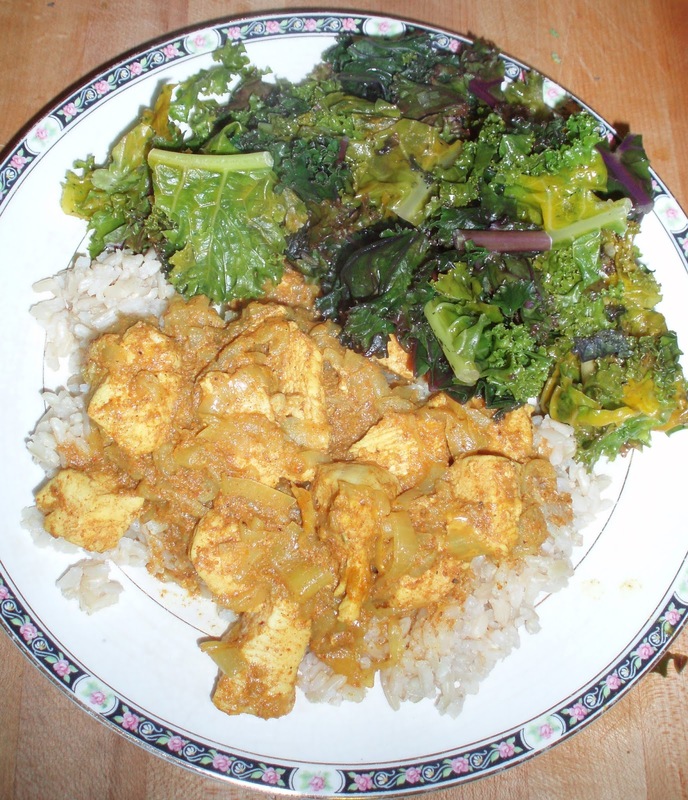 One day last week, when my schedule called for a quick and easy dinner, I decided to make curried chicken. 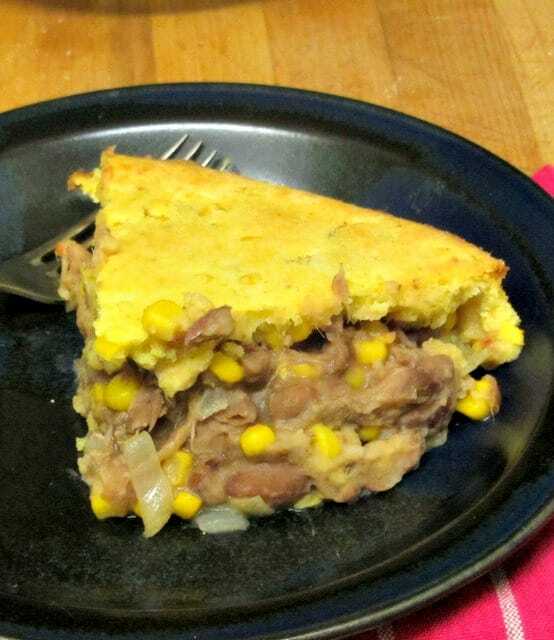 When I got home, I took out the frozen onion, and a boneless chicken breast. 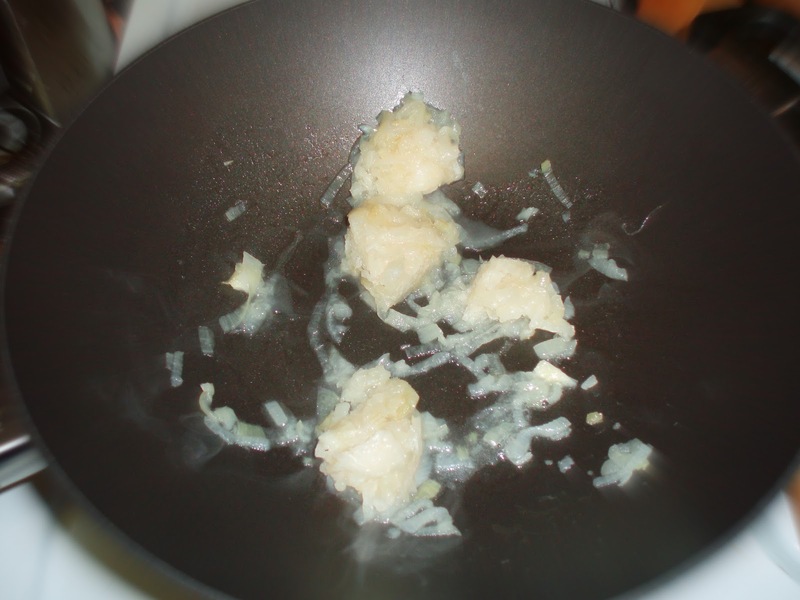 I broke off a chunk of onion, and dropped it into a saute pan over a medium flame, to melt while I cut the meat up in bite sized pieces. Once the onion was heated through, I sprinkled in some curry powder. 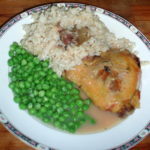 (As I’ve said before, the amount is going to really vary, both with your taste and with the heat of your curry powder.) 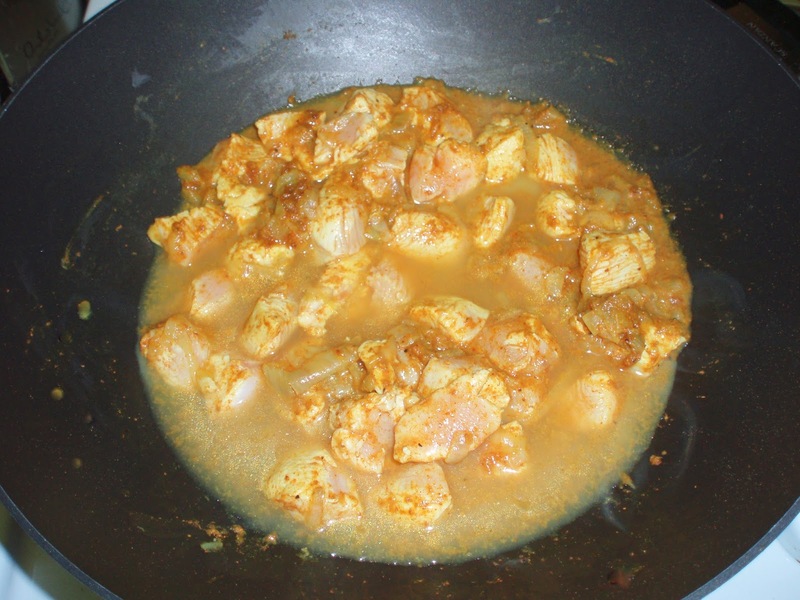 I stirred it around with the onion – sauteing the spice mixture helps bring out the flavor. 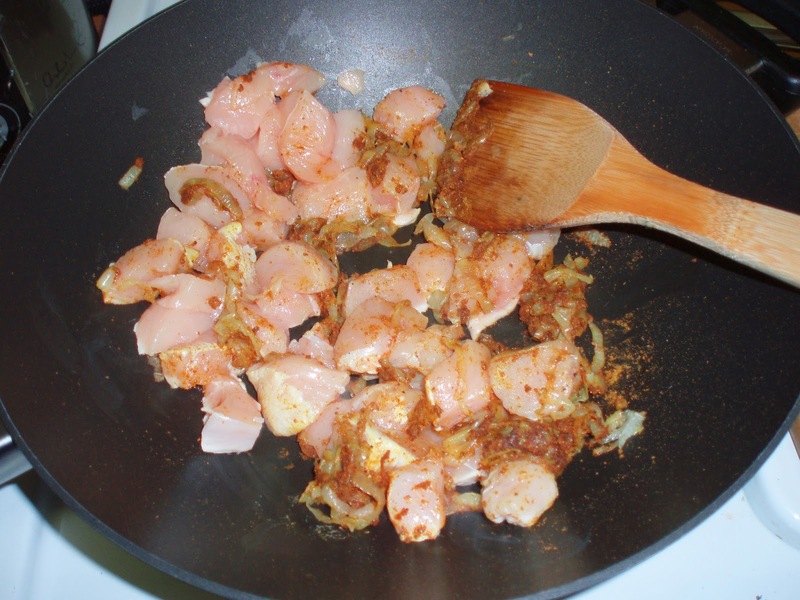 Then I added the cut up chicken, and stirred it until it was coated with the onion-spice mix and starting to brown. I poured in half a cup of water, brought it just to a boil, then lowered the heat and let it simmer about five minutes, while I heated kale and rice I had already cooked. I tasted it to be sure I had enough curry powder, and served. The water, onion, and spice had simmered down into a rich sauce. I don’t know if my friend from Goa would approve (well – probably he would – he’s very practical!) and I certainly would not claim this to be any cuisine but 21st Century New York – but it was good, and took very little time. If using fresh onion, heat oil in a pan, add the onion, and stir over low heat until absolutely soft. 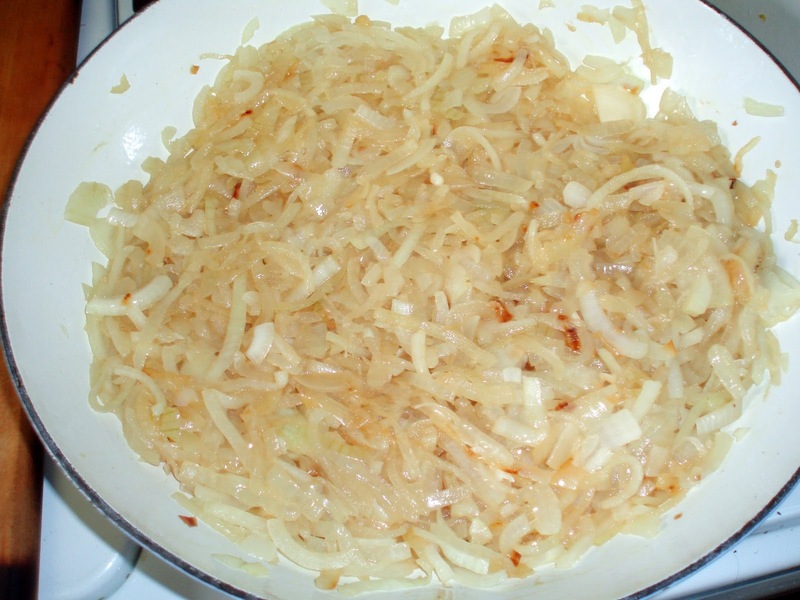 If using Frozen Melted Onion, place it in a pan over low heat until heated through. Stir curry powder into the onion. Raise the heat under the pan. Add the chicken. Stir until coated with the onion spice mixture, and let brown slightly. Add water. Thanks! I hope you enjoy it. I love doing a little work ahead so I can have a quick meal when I need one. Hope you enjoy it! 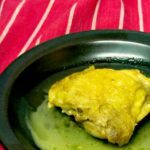 I am going to join, again - I found some interesting blogs with good recipes, last week. Thanks for hosting!